Greg joined Cormorant Realty in 2010. He has become one of the top producing agents in the area specializing in lake properties, rural properties and city homes in Becker, Clay and Otter Tail Counties. Prior to joining Cormorant Realty Greg enjoyed a 30-year career in law enforcement, retiring as Deputy Chief of Police in Moorhead. He was a business partner with his brother Gene in The Garageguys, a local construction company. 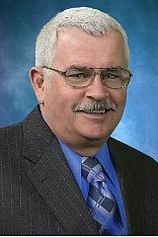 Greg served on numerous County and Township Boards and Commissions. He is well-versed in planning and zoning rules and regulations. Greg is no stranger to lakes country. His life on the lake began on Upper Cormorant Lake in 1972 and moved to Turtle Lake in 1999 where he and his wife, Julie reside. He is an avid scuba diver and knows as much about what’s below the surface as above the surface of many local lakes. Greg will put his broad range of expertise and knowledge to work for you. Work Ethic: Greg is a machine. He communicated with me before 6AM and after midnight, often on the same day. He is tireless and smart. Knowledge of his Profession: Greg knows the law and he knows the area and he knows many people. He provided a marketing strategy that WORKED. Integrity: In a word, Uncompromised. Extra yard: Greg worked "outside the box" many times. He attended Town and County Board Meetings on my behalf. He contacted contractors and arranged necessary work to make the lots ready for sale. He composed and provided Amortization Schedules, Rosters, Contact Information. Greg treated my money as if it were his own. I could fill a page with his extra work. Greg never had his hand out for more money from me. Communication: Greg was always "on top" of each deal, and so was I because of his communication skills. Professionalism: Greg was always polite and very accurate. He was always responsive to my input and gave exceptional advice when necessary. His buyers were happy. His seller is happy. Our house had been on the market nearly three years. During that time, we contracted with several different agents from the largest real estate companies in the region, but with no success. After taking the house off the market for a time, we were contacted by Greg. Greg felt he had some insight into the market, and was familiar with the area in which our house was located. In particular, Greg had been heavily involved in the flood mitigation efforts of our neighborhood, and he felt it was wise to market the house with that in mind. During the time we were listed with Greg, he was tireless. He did an initial inspection, and made suggestions on how we could make the property more attractive. When he discovered minor problems, he often took care of them himself. For the few larger problems, he was able to contact the appropriate person to do the work at a reasonable price. Greg regularly kept us apprised of the traffic at our house, and the progress of his efforts. Greg was able to sell our house for a very acceptable price within a very short time. He assisted us in every aspect of the sale, right up to the time of closing. Even at closing, Greg made sure that our interests were being looked out for. We have no hesitation in recommending Greg as a real estate agent. We feel he served us way above and beyond what other agents were willing to do. Mike and Michelle B. Thank you for all your help with the purchase of my lake home. I very much appreciated that you did not try to sell me any lake home. Rather you listened to what I wanted, researched all available homes and only showed me the ones that fit my description. This saved me (and you) the time and hassle of showing me homes that didn't appeal to me. To think that I purchased the very first home you showed me says a lot about how well you listened and researched. You went above and beyond by making sure the title was clear prior to the closing. Also, your vast knowledge of the lake region by living in the area helped me by being able to go to you seeking knowledge of local electricians, plumbers, etc. Thank you again for making the purchase of a lake home so hassle free. Douglas M.
I want you to know how much I appreciate all the time and effort you spent in completing the sale of my lake property. There were unexpected complications with the property description which necessitated extensive research into mortgages held by my neighbors and much of the research was fruitless. I know you made many visits and initiated countless phone calls trying to find answers to many questions that arose. You also helped me find a lawyer and communicated to him for me to get the Title work through court. I'm glad I wasn't paying you by the hour! You certainly earned your fee for what was probably one of the most complicated sales you have handled. Thanks for your tireless attention to details and your patience with me. You did a fantastic job and you have my great respect. I will gladly recommend you to anyone when I have the opportunity. Janine M.